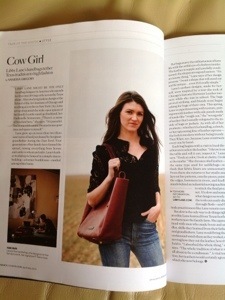 My two favorite magazines, Life:Beautiful and Garden & Gun arrived in the mailbox the other day. I wrote about Life:Beautiful here. Today I want to share with you a different kind of magazine. Unfortunately, I believe the south has an image problem. The media likes to portray the people as confederate flag waving- toothless-overweight-uneducated-rednecks eating pork rinds and marrying our cousins. Honey Boo Boo doesn’t help this image much. I was born in Chicago but moved to South Carolina soon after. Growing up we never had sweet tea, boiled p-nuts or okra. In fact, the first time I ever had grits was when I met Superman’s family in college. I met his kinfolk, rode a pickup truck and thought I was in heaven, eating homemade pimento cheese, peach cobbler and banana pudding. I love the south! 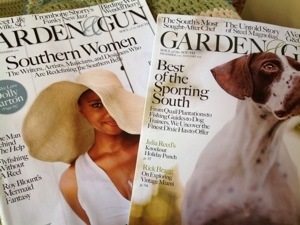 Garden & Gun Magazine is a bi-monthly publication out of Charleston, S.C. that defines “the soul of the south”. 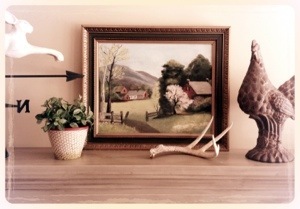 Like supermarket magazines, G&G has recipes, celebrities, entertainment and homes to look at. But what makes it different is that the recipes might be about Sapelo Island Clams, small batch spirits, or fresh caught quail. As for celebrities, you won’t hear about their latest exploits. In the Feb/March 2012 issue, Morgan Freeman takes you to his southern Mississippi roots. Artists like this leather bag maker are highlighted. I love reading about the men and women who hand carve boats, grind steel into oyster knives, and throw clay to create beautiful pottery. The latest music born in the south. G&G taps into the southern music scene featuring artists you may not hear on your local radio station but are so worth hearing. Having “gun” in your title, you must talk about Ihunting, right? I had never seen a gun before I met Superman. I was totally against them only because I didn’t have a clue about them. 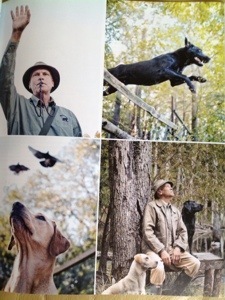 Now I appreciate the tradition of hunting, the skill in shooting and the fascinating work of the dogs. 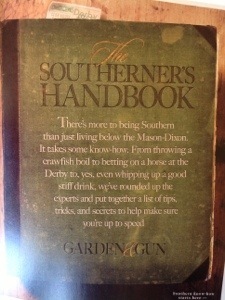 I love this….”There’s more to being Southern than just living below the Mason-Dixon.” Yes, there is! I love it here and reading this magazine makes me proud of my home. I am behind on my Joy Dare Challenge. In fact, yesterday I picked it up and the words just swam before my eyes. I was so tired. I took a nap instead. I am not, and have never been, good at downloading songs. 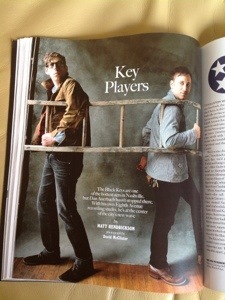 I still…gasp! buy CDs. I know, I know, so old school. So when my sister told me about this Pandora Radio, I flipped! YES! Someone figured out how to play the music I like without all the commercials and disc jockeys. (Do they still call them that? Anyway…) If you are not familiar with this computer application, it is quite easy. Go to Pandora and sign up…it’s free. Next create a radio station, which means put in an artist or type of music you enjoy. Then Pandora plays songs that are similar to your request. For example, I have a station called, Jack Johnson Radio. It plays songs by artists that fit that genre: Jack Johnson, Dave Barnes, Ben E. King, etc. I have another called Contemporary Christian, which plays Toby Mack, Casting Crowns, Sidewalk Prophets. You get the idea. 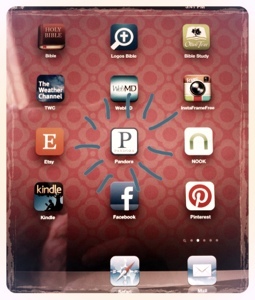 I listen to Pandora while piddling around the house through my t.v., on my iPod when I am exercising and also on my iPad. I can crank up the volume and sing out loud. I am so blessed to have friends and family who love me through the written word. I keep all of the cards and letters sent to me, especially those that are totally unexpected. 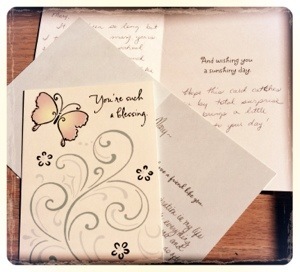 Unfortunately, I think the handwritten letter or card is almost extinct. I wrote about my card campaign here. Words misspelled, strike-throughs and messy handwriting is precious to me. I was named after my grandmother, Mary Catherine. But that isn’t where our similarities end. I believe we are both artists, bird lovers and crocheters. When she retired and moved to Florida, she took art classes. This is one of her pieces that hung in our house when I was growing up. I have it sitting on the mantle in my kitchen now. I am drawn to the country setting. I dream of living in the country on a farm with a garden, chickens and a pond to fishing. I can sooo imagine myself living here in this red house. She’s been gone now for almost 30 years, but she’s still here in her art. What gifts sung, written and painted do you have today? Share them with me in the comment section below!